For readers of my Transformers fanfiction: This lovely picture is almost exactly how I envisioned Octane's "Beyt'al-Ocatane" crew (Talifeyah and the rest), years ago. The only difference is that Al-Octane's crew uniform is a white hijab with sky-blue uniform tunic and trousers. But don't they look like they could be sitting in Skyfire's cockpit? 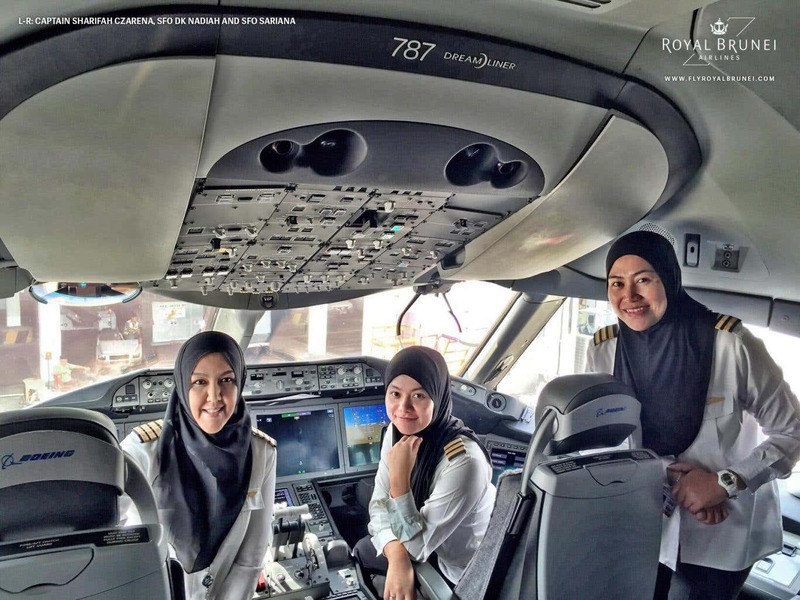 All congratulations to Royal Brunei Airlines and their first all-female crew. [TF:Prime] #2 in the "Reconstruction" series, set after the end of "Predacons Rising". SPOILERS LIKE WHOA! Megatron faces the first test of his new resolve--and Predaking, too. Just as a change of pace, here's a short Transformers:Prime vignette. Reconstruction: Decision at my site. ...and I can't believe that I didn't post View From the Top to FF.net until now. That fic has actually been up on my site for quite some time now, and I just noticed that it never got uploaded to FF.net. Oops. For the last few weeks, I've been re-reading my favorite threads (most of them) of a certain long-running, humongous LiveJournal roleplay that I participated in seven years ago, along with several other people on my F-list. (Hopefully you know who you are; it's been a while). We did some really awesome writing; I miss the interplay and creativity. Some crazy stuff happened, and characters joined in and went in directions no one had foreseen. If anyone wants to join me in feeling nostalgic, I did toss together some partial indexes for the ones I was involved in. (Sadly, the Rodimus Void RP arc was before my time and I never did get a link to the index). Some segments may be NSFW; hopefully there's a warning in the index. for the resolution of the Blackstar/Strata story, and Starscream's sudden reset into Past-Starscream than the Mayhems themselves. plus threads through numerous character journals. Someday I ought to re-organize this stuff with an eye toward particular character arcs that wove through the BigHugePlots. Duskwing's Redemption, Octane's Charter Trip From Hell, Starscream and Ratchet's friendship, Blackstar & Strata's Bittersweet Romance, the Implosion of the Stunticons (sadly, never resolved), Perceptor's Growing Family, etc. I have a project to salvage some of my favorite writing by re-purposing it into fanfiction; Wendigo's Bane is one such story, and you've probably seen familiar scenes and dialogue in some of my other stories, such as "Revelations". The one thing I can't do is recover other people's characters and writing--not without permission. What I would like to do is get in touch with y'all and see if we can collaborate on turning some of those interesting character arcs into stand-alone stories. Specifically, I'd like to turn Octane's Charter from Hell into a story--I'll be in touch, I hope, but if you are interested, PM me. I know it's been a long time, but: new story! Wendigo's Bane on my site. [G1, really late S3] Starscream finally takes his revenge on the thing that stole Skyfire from him and ruined his life so long ago--but the price may be too high. Sequel to "Revelations". Further note, the E-Book "Tales of Starscream" has been updated to include this new story. For those who may be interested: I finally updated the "Tales of Starscream" e-book package on my website to include the latest story, "Revelations". [G1, really late S3] Ever since he got his body back from Unicron, Starscream has been deep in denial about one little problem-but he can't deny the obvious much longer. Skyfire, too, has been in denial-and Starscream has information on that crash in the Arctic ice so long ago. It's too late to change the past, but not too late for revenge. So the idea I had was "How about a series of one scene shorts showing how the off-screen characters reacted to various story events? Or canonical events?" I think it would make a fun meme, so why not try it for your own stories or characters? Meanwhile, in S3-verse--how did people not on the scene react to news of various events? Presenting a series of short vignettes of well-known characters reacting to events on and off-screen from "Port Call:Cybertron" through "Justice is Served" to "Revelations". My website link: Reaction Shots. New Starscream story up on my site and FF.net. There's some Blitzwing and Skyfire too, but mostly Starscream. FF.net is bound and determined to screw up my formatting, so for reading purposes, I recommend the link to my site: Justice is Served. G1 S3 AU. Galvatron created the Decepticon Justice Division and sent them after Decepticon traitors, mutineers and deserters. The DJD is hot on the trail of their number one target: Starscream--but who is hunting whom? New Skyfire and Starscream vignette up at FF.net and on my site. Brief follow-up to "Survey Ship Visit". G1, late S3: Skyfire & Starscream make a port call on Cybertron. How do Skyfire's superiors view their unusual partnership? Back from vacation. Pictures to come later when I have the ambition. However, got a few things done lately. - over vacation, finished a Skyfire fic, "Port Call". No, it's not up yet. - as a bonus, eBook readers of "28 Dead Ends" get a preview of an unfinished 28, "On Vacation". I recently found this story on my hard drive; apparently I had set it aside for editing, and then completely forgotten about it! I found it, edited it, and it is now posted for your entertainment on my website and on FF.net. [G1, probably S4/2007] Skyfire & Starscream are surveying star systems for Rodimus Prime-but what do they do when they have to report on the politics and economics of a world that hates and fears intelligent machines? For those of you who like Dead End ficlets, there's ONE claim left in my ancient 28 Dead Ends meme: On Vacation. Go for it! As mentioned previously, I've been re-watching Season 3 of the G1 Transformers cartoon lately. It's better than I remembered, and sadly under-appreciated by most. Last night I watched a bunch of G1 season 3 episodes for the first time in quite a while, all the way through "Ghost in the Machine", and realized something. Last night, conversation in chat touched on Transformer zombies and the wonderful "City of Fear" arc in the old Marvel Transformer comics. Something I haven't posted in quite a while: another Dead End 28! Down to the last few, actually. [G1 Transformers] Wildrider inflicts more "culture" on Dead End; this time, it's the Arena. Dead End is bored; Wildrider tries to make it more 'interesting'. Also, for those of you who overlooked it, last week I slipped in Disheveled Dead End in my 28 Dead Ends.